For sale is a men's, 5/4/3. 5mm neoprene in the torso, 4mm neoprene in the legs & 3mm in the arms. Full body wetsuit with a zipper on the back. This suit is made with a high-quality CR neoprene (90%) and 10% nylon and are highly durable while maintaining a high level of flexibility and comfort. Small 34 R 27-30 115-135 lb. Medium 36 R 32-32 135-155 lb. Large 38 R 33-34 155-175 lb. XL 40 R 34-36 175-200 lb. XXL 42 R 37-38 200-220 lb. XXXL 44R 38-40 220-235 lb. The suggested temperature range is an approximate range for the water temperature where we have found that most customers feel comfortable with the protection offered by this garment. Please understand that there is a great deal of subjectivity involved as one person can have a different level of toleration to colder water then another and a myriad of other factors can influence the the overall comfort level. 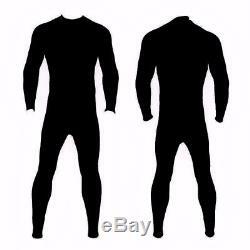 The item "5/4/3mm Full Body Neoprene Wetsuit Mens Back Zip Wet Suit 5/4/3 5mm 4mm 3mm New" is in sale since Friday, February 09, 2018. This item is in the category "Sporting Goods\Water Sports\Wetsuits & Drysuits\Wetsuits\Men".beauregard18" and is located in Hilton Head Island, South Carolina. This item can be shipped worldwide.